Still in the "happy" songs theme following Many Happy Returns, this is an Android application that plays a simple song to wish everybody a Happy New Year! It was released on 1st January 2013 but as long as the Earth keeps revolving around the Sun it can be used again and again, every year. Then you can download the app with the APK link on the right hand side, and it should install itself automatically. You can disable the option mentioned above once the application has been installed. 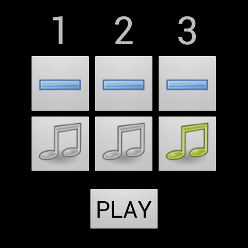 You can choose how many voices you want and add vibraphone while the song is playing. A special feature is that the notes are picked randomly, so the song keeps changing slightly. There's a small sample of what it sounds like on this page (of course it's more fun to play it "live" with the app). This is free software distributed under the terms of the GNU GPL license, and the source code can be downloaded with the second link as well as on Github. The audio data is also included in the source code archive.